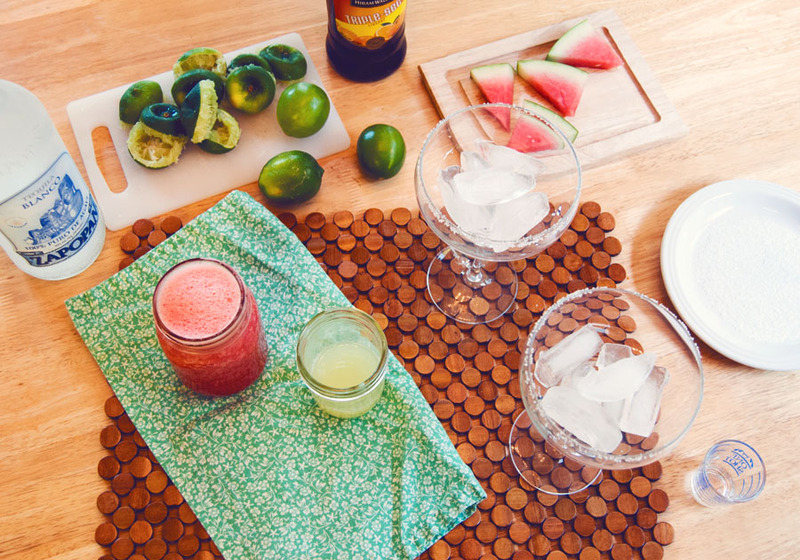 These drinks are what happens when you manage to make lemon bars taste like scary scrambled eggs, spend hours making gluten-free gnocchi that ends up turning into doggie treats, and make yourself a green smoothie that tastes like wet salad. Yes, I did these things. It got real. Oh, boy. I have some scores to settle with a couple of recipes. They will be mine. Mark my words. Maybe it’s unorthodox to have a margarita post on a Monday. But, you know what? Mondays are hard. Last week was hard. These would go really well with a couple of chicken tacos for dinner. Am I wrong? Go with it. It’s totally almost Cinco De Mayo. Yes, that holiday where we’re allowed to have a margarita with lunch and eat obscene amounts of guacamole on EVERYTHING. Gosh, that’s a good holiday! Let’s do that. This weekend was really warm in the Bay Area. It was verging on summer temperatures. My husband and I spent a lot of our time outside. There was a lot of grilling, entertaining and awkward tan lines. I don’t know about you, but when it starts to heat up, I fantasize about watermelon. I think about eating it by the slice. Cold. A lot of it. Admittedly, I tend to over do it with the first watermelon of the season. Things happen to your body when you decide to take on a whole watermelon by yourself. This is not recommended. Slow down. Be sensible. Share it with a friend of two. Make these margaritas! Sure they are pink and are garnished with a slice of fruity-goodness, but your dude-man-friend will totally like them. My manly-whiskey-beer-drinking-husband drank two. See? I even caught his man-hand on camera pouring himself a fresh drink. Good man. The ingredients are fresh and simple. 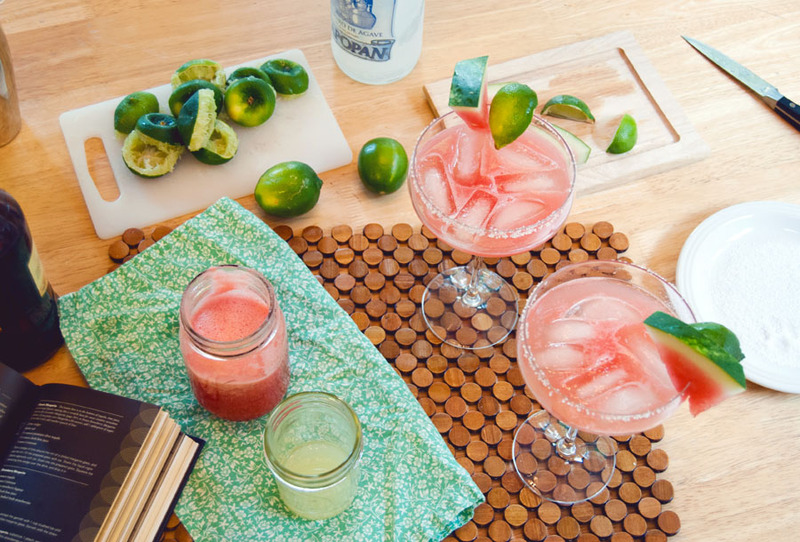 We juiced some fresh limes, pureed some watermelon in the blender, salted the rims of some glasses and the rest is simple and boozy. I know traditional margarita recipes call for Cointreau, but we didn’t have any on hand. Instead we used some plain, non-name-brand triple sec, which worked just fine. Feel free to adapt the recipe as you see fit. 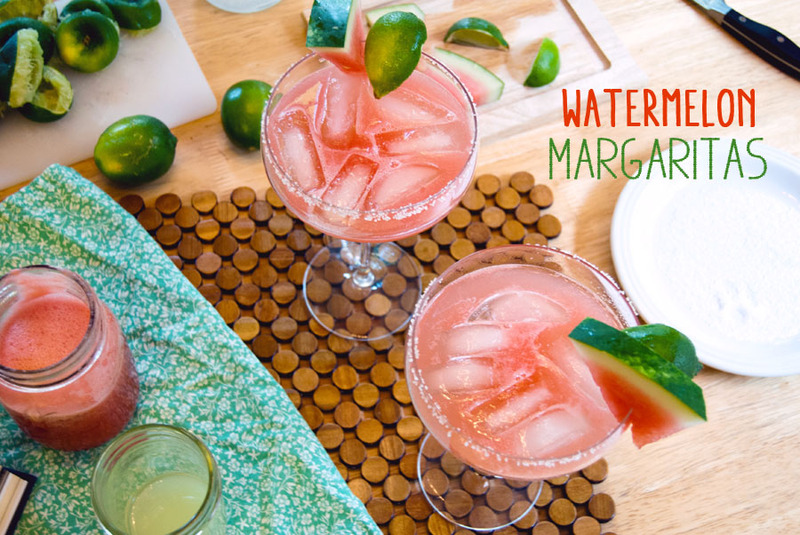 I prefer my margaritas on the rocks, but this recipe would make a fine blended drink as well! These are best enjoyed while sitting on the deck, lightly sweating, in unflattering workout pants. That last statement might be slightly subjective. Cheers, Friends! Here is a to a fantastic week! Slice up part of your watermelon, remove the rind, and add a couple of slices to a blender. I used two large slices of watermelon, and it yielded about two cups of watermelon puree. Add ice to your cocktail shaker. 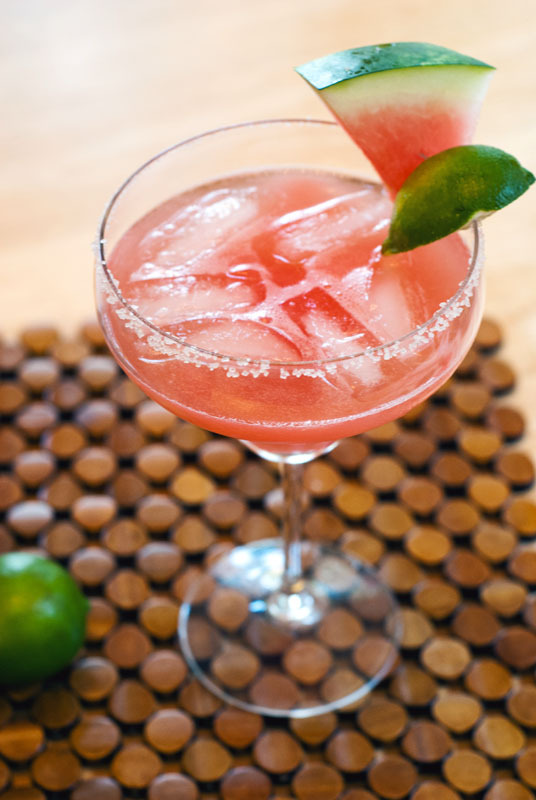 Add tequila, triple sec, lime juice, and watermelon puree to your shaker and shake vigorously. Salt the rim of your glass by running a lime wedge around the entire rim and then dipping the moistening lip of the glass into a shallow dish of sea salt. 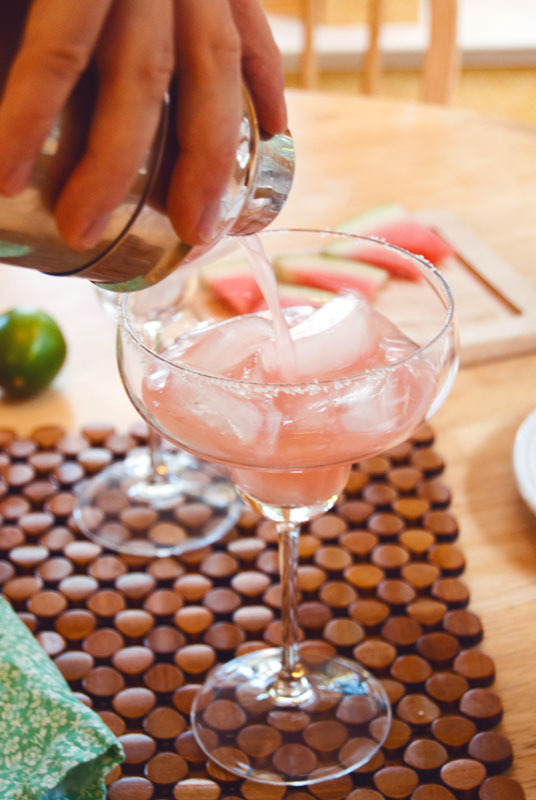 Add a couple of ice cubes to your salted rim glass, and pour the margarita from the shaker into the glass. 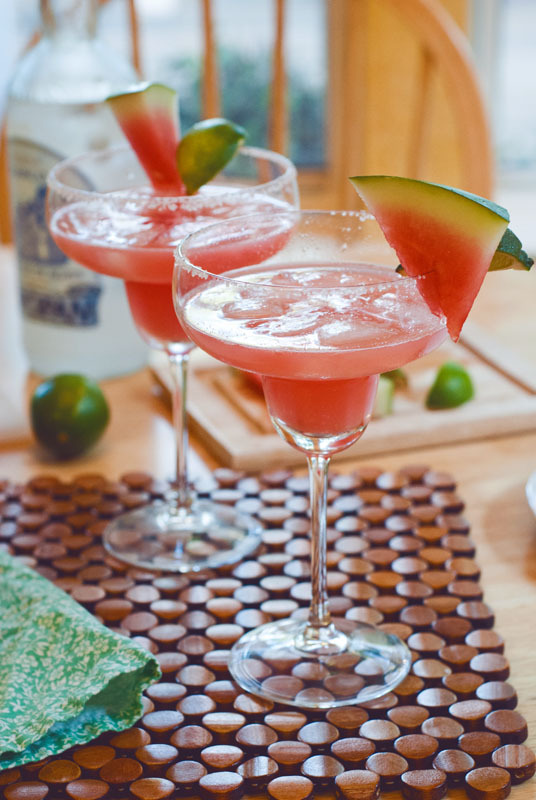 Garnish with a slice of watermelon and a lime wedge. If you want to prepare these as blended margaritas, forgo the shaker and put all of the ingredients into a blender and process on high. I would use approximately 10 ice cubes in the blended version. Serve in a salted glass. This recipe is amazing. Pictures are so beautiful too. This is my new go-to drink! LOVE THIS POST! Gorgeous photogs, girlie. I must make and drinks this immediately. Thanks, Majy-Maj. I have said it a thousand times… but, let’s just be neighbors again. Building tree houses could now be replaced by adult beverages.